State lines are imaginary. Sometimes they make sense, the top of a ridge or middle of a river, and sometimes they are marked by nothing more than a rusted fence or a sign on a random tree. But every time I cross an imaginary line between two states on foot, I feel powerful. I feel like all those steps I’ve strung together over mountains, down canyons, through creeks, and along roads have finally gotten me somewhere. Crossing borders makes everything feel possible again. I danced across the New Mexico border. It was nothing more than a fence and an idea. 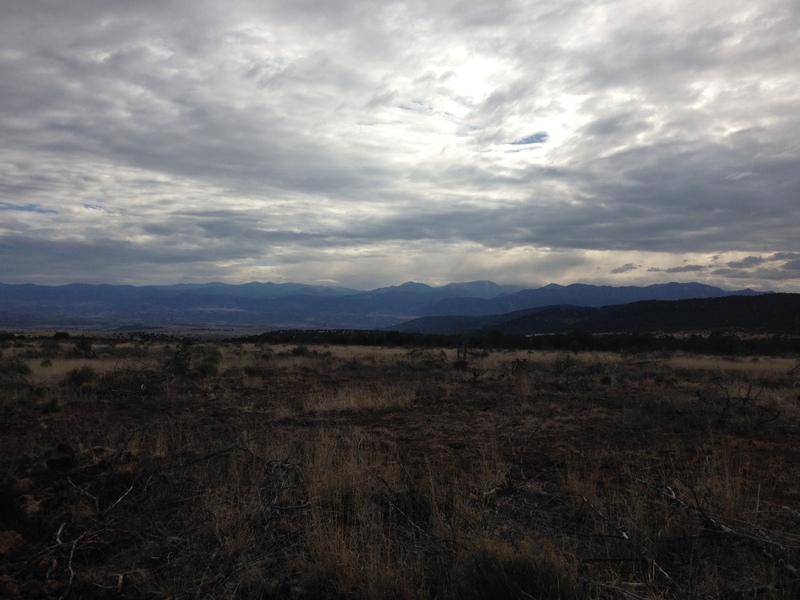 I crossed it skipping down a dirt road and staring ahead at the Mogollon mountains with adventure singing in my heart. Snow clung to the distant mountain tops, but I’d walked all the way from Phoenix to meet them and nothing would stop me. A mile past the New Mexico state line, I took a step and something thumped against the sole of my right foot. Another step, another thump. Step, thump, step, thump for a hundred yards before I twisted around to stare at the bottom of my shoe. A square flap of the sole had ripped out and hung on by a last bit of rubber. No, I thought, no shoe would fall apart after just three hundred miles. They usually last six, more if I’m lucky. I slipped a finger underneath the hanging flap and felt the soft jelly cushion underneath. If the rest of the sole fell apart, the underside wouldn’t last a day against rocks. Behind that, a bit of fabric, a thin insole, an even thinner sock. Then my foot. I thought of the pair of trail runners sitting useless underneath my bed at home. I’d used them just enough to know they fit then left them there in case I needed them for the last hundred miles or so of trail. I flicked at the rubber again, brushing away as much dirt as I could, then pressed the flap back in place and wrapped a piece of duct tape around the shoe. A mile later, the tape wore away and I walked the last miles to Alma to the sound of step, thump, step, thump, step, thump. Alma wasn’t a town. It was more of a store with a restaurant attached and a gas pump. I sat on the porch staring at my shoe and trying to clear my head as I ate bagels and cream cheese. A package would take four days at least. The nearest city was sixty-five miles down a barely-used highway. It would take me at least a day to get there and back with my thumbs, maybe two, maybe more. Rides are unreliable and even then, I might not find a shoe that fit. I sat staring at the sole and flap of rubber. The tread looked barely worn, its edges were sharp, the cushion didn’t look too crushed, the shoe had all the signs of life except for the hole ripped out of the middle. I kept staring at it like if I looked long enough it would fix itself. Four days for a package, two or three for an uncertain hitch. There was even a storm coming, so it made sense to wait, but waiting felt impossible. There’s a momentum I need on a trail, a feeling of forward progress that feeds into itself. This trail could beat me up with its climbs and dry distance, but it couldn’t stop me. I’d always moved forward. I needed to move forward. It was part of my identity, part of my will. Stopping felt impossible without stopping forever. I stared at the flap of rubber hanging off the shoe. I wanted to scream at it. We had a deal, we were partners, and you betrayed me in the middle of nowhere. It just hung there, mocking me. I bought a tube of glue in the store, squeezed it under the flap, and duct taped it in place. I knew it wouldn’t hold, not for more than a few miles anyway, but it was enough of a lie that I could slip my foot back in the shoe and walk on, every mile making it harder to turn around. Posted in Grand Enchantment TrailTagged GET, grand enchantment, shoes, state linesBookmark the permalink. I like how you talked to your shoe. I’ve done that too. And like you I got no response…just that mocking stare back at me. Great being back on the trail with you (you left us hungry for more!) Thanks for finishing out the posts despite the passage of time . . . they feel perfectly in-the-moment to me.